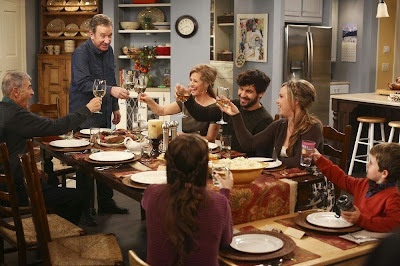 For a Thanksgiving episode, this episode really showcased a lot of selfish people. Eve wanted nothing more than to sit with the adults at the dinner table. Mandy wanted Kyle to leave his elderly grandmother alone. Kristin and Vanessa seemed to be barely involved in anything but drinking wine. Ryan blindly bet $20 on something he knows nothing about, which is a valuable chunk of change for his family. Mike only wants to follow the game in peace, even if that means via radio instead of television. It's no wonder that little Boyd was having a tough time doing his homework assignment! As realistic as this family dynamic may be, it wasn't great to see play out on a holiday. Mike's dad shows up, excited that he now has a license to sell marijuana when it becomes legal in Colorado in January. He wants to partner with Mike, but Ed is more interested. However, after talking to Ed, Mike decides to help his father... but he doesn't actually want to be part of the business, so he will market it on the sly. [Ryan explaining "the munchies" was amusing.] But, between his father's business proposition and Ryan caring about football for the first time (thanks to a terrible bet), Mike is unable to enjoy the holiday football games.